GAYography Blog - gAytlas.com: Ethiopia Part 2: Why I Censored My Own Post! Ethiopia Part 2: Why I Censored My Own Post! As a (always) fun-loving writer, it's strange for my obscure, gay-mapping (and yes, I'll say it) very frivolous blog to get the kind of traffic I have received for my recent Ethiopia piece. But because of a particular person and his careless moves to breed fear within the Ethiopian LGBT community, this blog is getting lots of attention! Namely now by people who want me to censor it - and this type of request gives me great pause as a writer. Let's start from the beginning, a well-meaning Ethiopian who wanted to celebrate my blog and share it with more of the LGBT community in Ethiopia posted it in a secret LGBT Facebook forum. His and other comments began positive - but then a western writer decided to quickly alter the celebration. 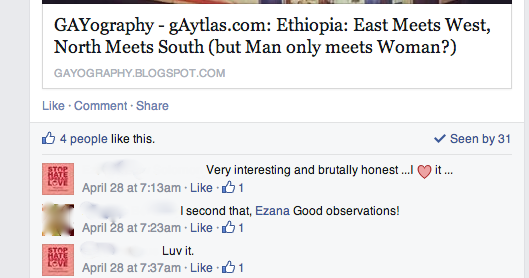 He began raising questions about my blog mentioning a couple of known LGBT places in Addis - and "exposing" them. Backing up - before writing this blog, I inquired among gay friends I met in Ethiopia about what I should write - and I also presented only three venues (we all know there are many more). I did consider the consequences of writing about these venues - but first, they are known to be gay-friendly, second my blog (sadly) remains pretty unknown ;) and third (and most importantly to me) gay contacts and friends agreed that this was ok. Thus before as well as after I received positive feedback from many LGBT friends and contacts in Ethiopia. Someone confirming I have not revealed anything new! However, once this particular foreign agent (I'll call him) started calling me unethical for "exposing" these venues and scaring people into believing my obscure post would cause people to be jailed and venues to be closed, all of a sudden, Ethiopians became fearful. A few became forceful and I reached out directly to talk to them and try and understand their fears. They now believed my blog read by (mostly) Americans somehow lit-up huge rainbow lights at each of these (now-unnamed) locations - as if the dozens of gays who frequent them go unnoticed in reality. As if I could somehow discover information religious homophobes and a repressive government (with tons of human and monetary resources) couldn't readily find if they wanted to. No, now - this guy had made me the enemy, and what a convenient one: just one person, easily berated and insulted online! I'll admit that I don't know the fear that gay Ethiopians are burdened with - I have not had to face it - but I truly tried to talk to these people; I reached out to everyone to try and resolve their fears. I remain upset at how much fear they felt and it's terrible they feel they must face this. But at least the Ethiopians reached out to me directly; the westerner who fueled the flames and made unfound accusations still has not directly reached out to talk to me. He simply continued to vaguely threaten me in the secret forum. I chose not to respond to someone like this - and nor will I mention his name here - because there's just no need. Perhaps someday he'll reach out to me directly. My first question will be why he chose to fuel fear in the Ethiopian LGBT community instead of just reaching out to me directly with his concerns. We appear to have common friends and contacts in the U.S. - so he could have used this knowledge and friendly contacts to influence me to make the changes he thought were necessary. Instead, he decided to incite a campaign against me by taking advantage of the fears in the Ethiopian LGBT community - and upset a number of people. Out of respect for the small number people who have reached out directly and asked me to remove the locations, I am now removing the names of specific locations in my blog (also I don't want gay venues to loose any customers!). But I want to re-iterate that I'm doing this only out of respect for them - and also because I don't want to waste anyone's precious time trying to fight me - when there are so many enemies already in Ethiopia. I hope this time saved can be spent focusing attention on (little-by-little) coming out, finding allies and building a movement that will someday achieve LGBT acceptance in Ethiopia. I'm also looking forward to marching someday in the first Pride parade in Addis - I'm here to help to anyone who wants a hand! I know it's a long fight - but it can and will eventually be achieved. For more information please email me at ashton@gaytlas.com - I love to hear your feedback here or via email. Thank you!